WILMINGTON, NC, July 3, 2017 – Two popular Topsail Beach businesses, Topsail Island Trading Co and The Gift Basket are the first businesses on the island generating their own electricity using the sun’s energy. 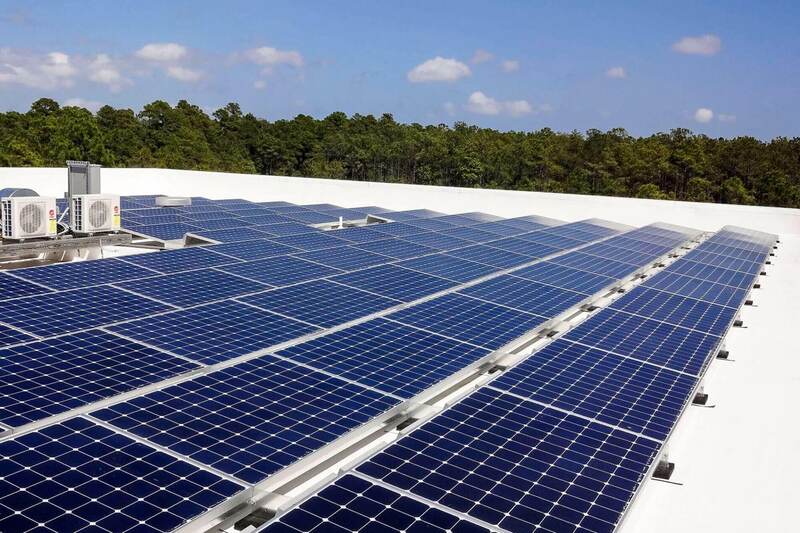 The roof-mounted solar systems, designed and installed by Wilmington based Cape Fear Solar Systems, have produced over 51,000 kWh of electricity to date, enough to power approximately 57 average size homes for an entire month. Both businesses are run by Topsail residents Grier and Kristin Fleischhauer, their daughter Claire, and son-in-law, John Noto. Approaching their one year anniversary of going solar, Cape Fear Solar would like to congratulate the business owners for their choice to generate clean energy from the sun. Learning about the technology from fellow residents, the Fleischhauer family decided to install solar panels on both of their businesses in July of last year to lower their dependency on the utility company and contribute to the environment by generating clean renewable energy. 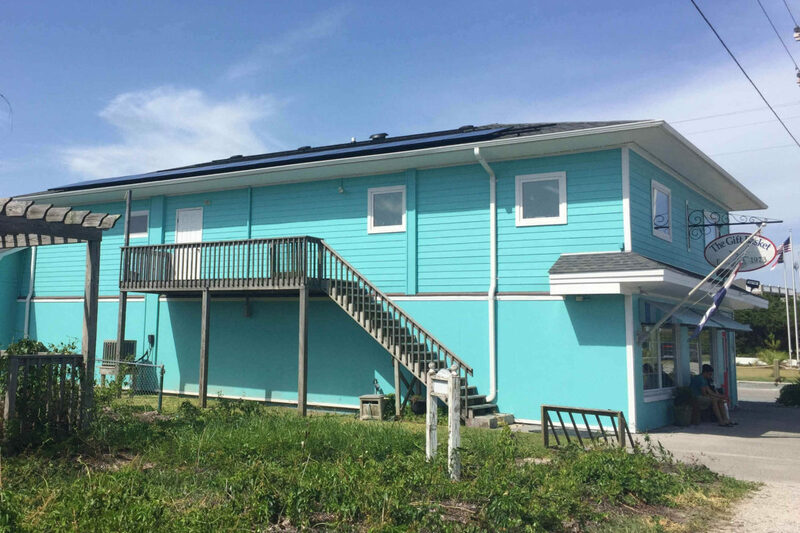 A 20.80 kW system has been placed on the roof of the Topsail Island Trading Co, located by the entrance of the island in Surf City, and a 19.84 kW array at The Gift Basket in Topsail Beach. Both systems combined are expected to save $171,555 over a 25-year span. 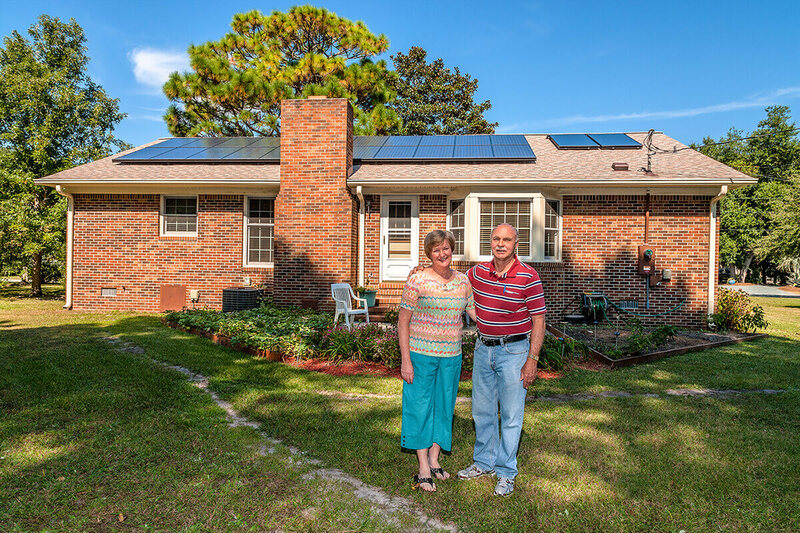 “Cape Fear Solar Systems has been a pleasure to work with,” says Grier Fleischhauer. “Their professionalism, expert knowledge of their technology and caring for the customer is impressive. The installation was efficient and punctual, taking less than a week to get our systems up and running,” he notes. “To date, we have saved $1,857.00 at The Gift Basket and $2,181.00 at the Topsail Island Trading Co in utility expenses,” Grier says excitedly, “In addition to these savings, both locations produced more electricity than consumed, selling the excess power back to the grid. Our systems, due to the tax savings, tax rebates and energy savings will pay for themselves in about 4 years. That is a great return on investment,” Grier highlights. The solar systems were designed using SunPower solar modules, holding the world’s record for the most efficient rooftop solar panels. Topsail Island Trading Co and The Gift Basket are being powered by the same solar panels that powered the first solar plane to ever travel around the globe without using a drop of fuel. 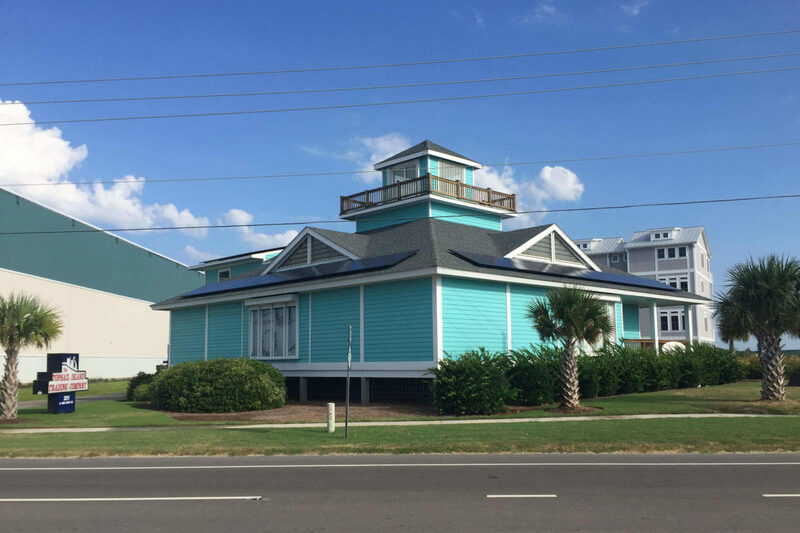 The panels are rated #1 for durability with the ability to withstand extreme weather conditions, making them perfect for Topsail Island businesses and homes. From the first flip of the switch, SunPower delivers maximum value and superb performance and even comes with a 25-year warranty. SunPower solar panels can only be installed by an approved solar installation company and Cape Fear Solar is proud to be an Elite SunPower dealer for the region. The number of Topsail Island residents looking to make a positive impact on the environment by producing their own power is growing. “Currently, we have installed solar energy systems on seven properties on the island,” says Matt Palmer, Cape Fear Solar Systems’ Technical Sales Consultant. “I truly enjoy educating property owners about the many benefits solar energy offers. Once I explain the environmental and financial benefits of going solar, it is a no-brainer for most,” he explains. The Topsail Island Kiwanis Club will host a solar lecture for its’ members on July 18, 2017, where the first two commercial solar installations on the island will be introduced in greater detail. “Topsail Island Trading Co and The Gift Basket are proud to be the first Topsail Island business contributors to the solar movement, leading the way for many other local homes and businesses to go solar,” Mr. Fleischhauer concludes. View more images of the Topsail Trading Co and The Gift Basket featured in Our Work. For more information about the businesses visit their site www.tideandweather.com.